Why did so many Lebanese civilians lost their lives to Israeli bombing? The government line is that the IDF was doing the best it could, but these deaths were the result of Hizbullah hiding its rockets and fighters among civilians. But that assertion doesn't stand up to the facts. Of course Hizbullah did sometimes hide among civilians, breaching its duty to do everything feasible to protect civilians and possibly committing the war crime of deliberate shielding, but that's not the full story. Human Rights Watch investigated some two dozen bombing incidents in Lebanon involving a third of the civilians who by then had been killed. In none of those cases was Hizbullah anywhere around at the time of the attack. How do we know? Through the same techniques we use in war zones around the world to cut through people's incentive to lie. We probed and cross-checked multiple eyewitnesses, many of whom talked openly of Hizbullah's presence elsewhere but were adamant that Hizbullah was not at the scene of the attack. We examined bombing sites for evidence of military activity such as trenches, destroyed rocket launchers and military equipment, or dead or wounded fighters. If we were unsure, we gave the IDF the benefit of the doubt. The case of Kana shows how this works. After two Israeli missiles killed 28 civilians in a house there on July 30, the IDF initially charged that Hizbullah had been firing rockets from the vicinity of the targeted house. But Human Rights Watch investigators who visited Kana found that there had been no Hizbullah presence near the bomb site at the time of the attack. IDF sources later admitted to an Israeli military correspondent that Hizbullah wasn't shooting at all from Kana that day. In some cases, the IDF trotted out video of Hizbullah firing rockets from a village. But it has yet to show that Hizbullah was in a civilian building or vehicle at the time of an Israeli attack that killed civilians. Blaming Hizbullah is simply not an honest explanation for why so many Lebanese civilians died. And without honest introspection, the IDF can't meet its duty and self-professed goal to do everything possible to spare civilians. HIZBULLAH CERTAINLY should not be let off the hook. Human Rights Watch has conducted detailed investigations of the militia's obvious war crimes - its deliberate efforts to kill Israeli civilians by indiscriminately targeting Israeli cities. Israel had every right to try to stop Hizbullah from raining death and destruction on its people. But under international humanitarian law, just as Israeli abuses in Lebanon did not justify reprisals against Israeli civilians, so Hizbullah's war crimes did not justify Israel shirking its duty to protect Lebanese civilians. So what was the cause of so many civilian deaths? The IDF seemed to assume that, because it gave warnings to civilians to evacuate southern Lebanon, anyone who remained was a Hizbullah fighter. When the IDF saw a civilian home or vehicle that Hizbullah might use, it often bombed, even if, as in Kana, Srifa, Marwahin, or Aitaroun, there was no evidence that Hizbullah was in fact using the structure or vehicle at the time of attack. In weighing the military advantage of an attack against the civilian cost, the IDF seemed to assume no civilian cost, because all the "innocent" civilians had supposedly fled. Through these calculations, the IDF effectively turned southern Lebanon into a free-fire zone. But giving warning, as required by international humanitarian law, does not relieve the attacker of the duty to distinguish between civilians and combatants and to target only combatants. Otherwise, Palestinian militants might "warn" Israeli settlers to leave their West Bank settlements and then be justified in attacking anyone who remained. Hizbullah might have done the same in northern Israel. Nor does an evacuation warning mean that all civilians did in fact flee. Many remained in southern Lebanon because of age, infirmity, inability to afford exorbitant taxi fares charged for evacuation, or fear of becoming yet another roadside casualty of IDF bombing. As a result, the IDF's indiscriminate bombardment had devastating consequences for civilians. SO HOW SHOULD the IDF fight such a war? By complying with international humanitarian law. That means not treating southern Lebanon as a free-fire zone. It means attacking civilian structures and vehicles only if there is evidence that Hizbullah is actually using them. Even then, it means making serious efforts to determine whether civilian structures and vehicles contain civilians, and attacking only if the definite military advantage is so powerful that it justifies their deaths. Above all, it means treating Lebanese civilians as human beings whose lives are as valuable as Israelis'. Protecting Israelis from Hizbullah's deadly rockets is vital, but it does not justify indifference to the taking of civilian lives on the other side of the border. The writer is Executive Director of Human Rights Watch in New York. I read your article “indiscriminate bombardment” in the Jerusalem Post of August 18, with a mixture of sadness and astonishment. Sadness, because the type of biased reporting in your article, damages the credibility of your great humanitarian organization. Astonishment, because your methodology flatly contradicts HRW’s claim that it employs researchers to conduct fact-finding investigations into human rights abuses. The presentation of conjecture as facts in your article cannot by any stretch of imagination be considered as fact-finding,. The latter requires impartial examination and evaluation of all the available evidence without regard to whether or not it may contradict preconceived opinions. Allow me to be explicit. You claim that Israel’s declaration that the IDF was doing its best to avoid civilian deaths, taking into account Hizbollah’s hiding of rockets and fighters among civilians, “doesn’t stand up to the facts”. However, you follow this up by quoting mere opinions as if they were facts. You admit that Hezbollah sometimes hide among civilians, breaching its duty to do everything feasible to protect civilians and you add almost reluctantly “possibly committing the war crime of deliberate shielding”. Why “possibly”? Are you not certain that locating military objectives near a concentration of civilians is a war crime? And that the laws of armed conflict do not preclude attacking a legitimate military target in the proximity of civilians? As it is always important to avoid confusing cause and effect, one cannot ignore the regular, cynical and grossly illegal practice of Palestinian terrorists and Hezbollah of hiding behind civilians, and even launching their rockets from civilian houses. Where have HRW investigators been while this inhumane practice has been deliberately used from day one; in Jenin and Gaza for example, where terrorists operate among civilians, including children. All serving as human shields. You write that HRW investigated some two dozen bombing incidents in Lebanon and found that in none of them was Hezbollah anywhere around at the time of the attack. As you came long after the attack one may well ask, apart from hearsay, how you determined who was around at the time of the attack? You will surely recall reputable reporters having confirmed that Hezbollah fighters wear civilian clothes making it impossible to distinguish between them and civilians. How the can you be certain that the persons you questioned were not themselves Hezbollah fighters.? The pictures on the above right, show convincingly how Hezbolla operates from civilian areas and how impossible it is, to distinguish between Hezbolla fighters and civilians. (AdelaideNow July 29, 2006). There are other peculiar aspects. It was reported that the roof of the building was intact when first viewed. Journalist Ben Wedeman of CNN noted that there was a larger crater next to the building, but observed that the building appeared not to have collapsed as a result of the Israeli strike. You will recall widespread reports that civilians were unable to flee Qana due to Israeli destruction of bridges and roads. In the circumstances one wonders how HRW investigators journalists and rescue teams had no problem getting there in droves. And then you claim that HRW “investigators who visited Kana found that there had been no Hezbollah presence near the bomb site at the time of the attack.” Really! Just a little fact-finding research reveals that it is futile to expect evidence of a rocket launcher hours after a firing. According to the neutral Global Security Organization, mobile rocket launchers move out from underground facilities, fire from preplanned firing positions, and return in a few minutes to protected caves or to alternative firing positions. As the executive director of the largest human rights organization, it is remiss of you to presume that lack of evidence of innocence is evidence of guilt, a common logical fallacy which violates the principle of presumption of innocence until proved guilty. You lightly fobbed off, as of no consequence, the advance warnings given by Israel to civilians expressly in order to minimize civilian casualties. It would be only fair to make a comparison with the completely opposite attitude of Hezbollah whose declared intention remains to kill and maim as many civilians as possible. Giving advance warning of a rocket attack by Hezbollah would contradict their entire purpose. Mr. Roth, when you write in a derogatory manner, “In some cases, the IDF trotted out videos of Hezbollah firing rockets from a village” and you then summarily dismiss this evidence as of no consequence without due examination and analysis, you give the impression of being unwilling to consider any information which may influence your preconceived views. I have never read HRW referring to Hezbollah or the Palestinians as “trotting out evidence”. Graphic images smuggled out from Lebanon show how Hezbollah is waging war amid suburban homes. A stream of images, obtained exclusively by the News Ltd, depicts how the extremists are using high-density residential areas as launch pads for rockets and heavy calibre weapons. 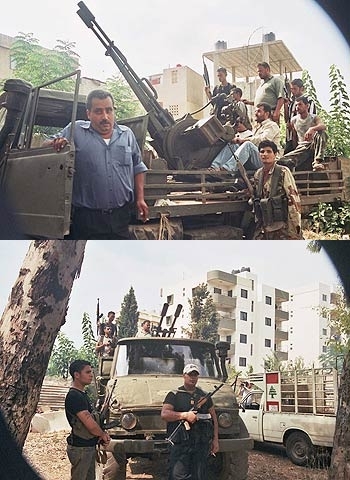 Dressed in civilian clothing so they can quickly melt back into suburbia, the fighters carrying automatic assault rifles ride in on trucks laden with cannons. The photographs from the Christian area of Wadi Chahrour in the east of Beirut were snapped by a visiting journalist caught in the midst of the war, then smuggled out by a friend.